You don’t need to be a rail buff to want to download the Federal Railroad Administration Rail Crossing Locator app. Parents, outdoor enthusiasts, emergency responders, school officials, motorists and many others will find value in locating area highway-rail crossings. The aim of the app is public safety and the Department of Transportation (DOT) recently added an Android version of the app. The Rail Crossing Locator app uses your current location to display nearby points on a map where a railway line crosses a road or path, as opposed to when a railway line crosses over or under a road via a bridge or tunnel. Download the app, open it up, search for nearby rail crossings, and watch the app’s map populate with rail crossing points around you. You can search for crossings by address, geo-location or DOT Crossing ID. The app even contains a full accident history report at each location. plot your course with help from this app to avoid potential danger zones. Download this app to join the Federal Railroad Administration’s efforts to improve rail crossing safety. 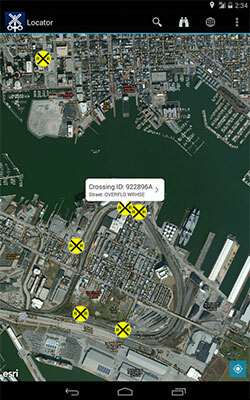 The Rail Crossing Locator is available for Android and Apple iOS smartphone and tablet devices. You can download this and other cool mobile government apps with just a few clicks from our USA.gov Federal Mobile Apps Directory. Federal agencies can get their apps in the directory by using the Federal Mobile Product Registry.